BREMEN – The Cleveland Lady Panthers and the Southeastern Mustangs traveled to Cold Springs for a pair of Class 2A, Area 12 championship games Friday night and both squads were sent home empty handed. The Lady Eagles blasted Cleveland 92-36 behind an epic shooting performance, tying the state record with 20 made 3-pointers in the game, and the Eagles held off a late push from Southeastern to take the area title 60-49. The Lady Eagles made short work of the Lady Panthers tonight. A three from Camryn Crider put Cold Springs ahead 10-2 midway through the opening period and the Lady Eagles were able to take advantage of turnovers to make it 24-8 by the start of the second. Elizabeth Hill added a 3-pointer midway through the second quarter to stretch the lead to 33-8 and Cold Springs pushed it to 46-10 by the halftime break. The Lady Eagles continued to pour it on in the third, widening the gap to 60-16 midway through the period with a 3-pointer from Neely Ellison. 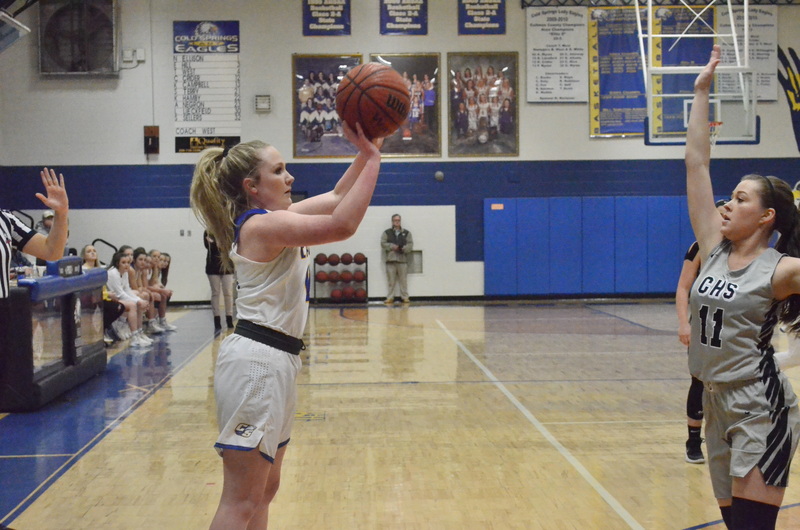 Cold Springs led things 69-18 at the start of the fourth, and the shots just kept falling; the Lady Eagles pulled away to win it in convincing fashion, 92-36. Cold Springs tied the state record with 20 3-pointers in the win, nine of which came off the hand of Crider. Crider led the Lady Eagles with 29 points, followed by Hill with 16, Toni West with 14 and Lina Liekfeld with 12. Cold Springs will be back in action Monday night at 7 p.m. when it hosts a sub-regional matchup with Vincent. Both teams got off to slow start in this one a layup from Adam Hill gave the Eagles an early 5-4 lead. Logan Rice laid one in to tie the game at 10 just before the first quarter expired, and a three from Micah Calvert put Cold Springs in front 16-13 midway through the second. Calvert added another three points with just 20 seconds remaining in the period to give the Eagles a 23-17 lead at the half. Landyn Freeman stretched the lead to 29-20 with a basket midway through the third and Cold Springs was able to create a lot of separation in the latter half of the quarter. The Eagles outscored the Mustangs 17-9 in the third to take a 40-26 advantage into the final frame. Things got a bit scary for Cold Springs in the fourth. The Eagles were on top 44-31 at one point in the quarter, but offensive rebounds led to second-chance points for Southeastern and it was able to trim the lead all the way down to 50-47 with less than two minutes to play. Fortunately for the home crowd, Brody Peppers knocked down a mid-range jumper with less than a minute left to give Cold Springs a 54-49 lead, and the Eagles put it away at the free-throw line after that. Calvert nailed four shots from behind the arc and led Cold Springs with 21 points, followed by Freeman with 15 points, Mason Harris with nine and Peppers with eight. The Eagles will be back on the court Tuesday night at 7 p.m. when they host a sub-regional showdown against Vincent. The Good Hope Raiders came up just short at Oneonta in their area title game Friday night, falling 63-60. As a result, the Raiders will hit the road Tuesday night for a sub-regional matchup against DAR at 7 p.m. The Lady Bearcats put together a much better performance tonight than they did the last time they saw the Lady Tigers but still fell just short at Hartselle, 71-58. Cullman will now travel to Muscle Shoals Monday night for a sub-regional matchup against the Lady Trojans at 7 p.m.